Aggressively meeting your needs with the resources of a full-service firm. 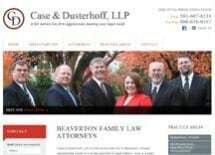 Case & Dusterhoff, LLP, is a full-service law firm in Beaverton, Oregon, representing clients in a broad spectrum of legal matters, including family law, business law, bankruptcy, real estate law, construction law, personal injury, attorney (legal) malpractice and DUII assistance. Our approach to family law fosters civility and peaceful resolutions. We encourage our divorce clients to avoid the mindset that there is a "winner" and to focus on the long view, so that they are better able to preserve cordial relationships with their former spouses and healthy relationships with their children. When handling high-asset divorce cases, we approach them with the same attention to detail as business litigation. For clients facing bankruptcy, we help them gain a fresh start and put a stop to creditor harassment. We handle both Chapter 7 and Chapter 13 bankruptcy cases for individuals as well as Chapter 11 for businesses and Chapter 12 for farms. Our lawyers handle the purchase and sale of businesses, assist new businesses with entity formation, and resolve business disputes through mediation, arbitration and litigation. We handle both commercial and residential real estate matters, including purchase, sale and foreclosure assistance. An integral part of real estate law often entails construction issues, ranging from contract negotiation to construction defect litigation. Personal injury litigation is a focus in our firm. Auto, truck, motorcycle, slip and fall, and other injuries due to the fault of another can be devastating, and our goal is to maximize recovery for our clients with no fees charged until a recovery is made. Attorney malpractice can cause significant economic loss. We pursue recovery of those losses, again, with no fees charged until a recovery is made. DUIIs happen to good people. Our lawyers take forceful action to protect your constitutional rights to the fullest extent of the law and minimize the impact that a DUII can have on your life. What sets Case & Dusterhoff, LLP, apart from other law firms is our team approach. Our attorneys consult and advise one another on cases, and when a case goes to trial, our entire firm is behind the effort. At Case & Dusterhoff, LLP, we work aggressively and efficiently to meet your legal needs.